Cut the veggies into little cubes or wedges, as long as they're pretty much the same size so they cook evenly. The Radishes will be the toughest so they can be cut slightly smaller than the potato and beet cubes so that everything will cook to pretty much the same tenderness in the oven. Combine your spices (not the fresh herbs - they're for topping) and salt and pepper in with your oil and then mix it in with your cubed veggies in a big bowl until the oil spice mixture covers them. Dump the veggies out onto a baking sheet lined with foil and roast on 350º until tender, about 35 minutes or so. Check them about 20 minutes in to make sure they're not burned - everyone's oven is different. 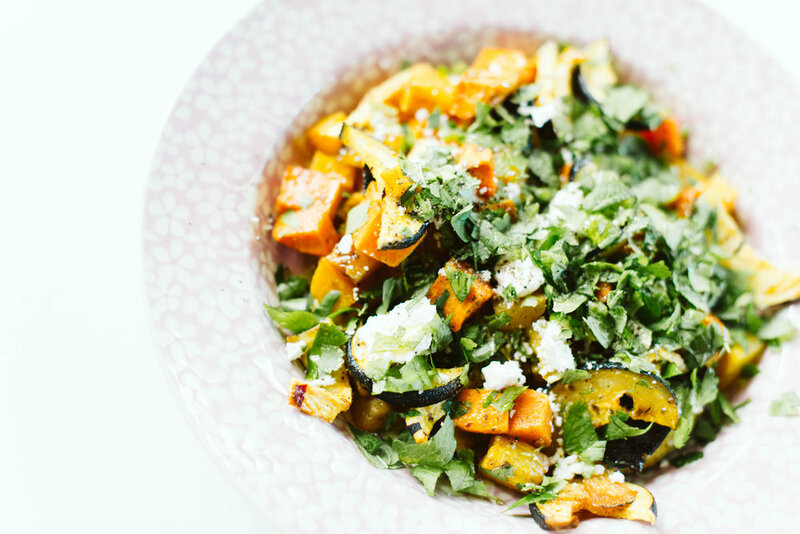 Scoop your veggies onto a plate or bowl, top with goat cheese and fresh herbs, and toasted cashews or almonds (nuts aren't pictured here but we added them when we had this for leftovers a second time and it was awesome with the added crunchy texture). Serve warm or room-temp. Have fun with it - try different spices if you want! Cinnamon would be a great addition, as would curry and some toasted coconut!